Now that it's summer, you're out and about much more. Maybe you're traveling with the family or you just don't want to be limited to indoor workouts. 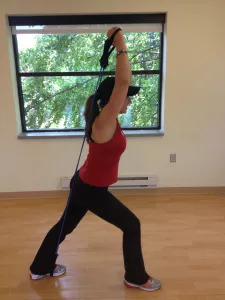 If you've done your share of body-weight exercises and you’d like to change it up, you only need one tool that you can take anywhere to tone your arms: a resistance band. Don't be fooled...they're more challenging than they look! If you’re a beginner, you’ll want to look for a band that is a light to moderate thickness. The thicker the band, the more challenging it will be. It’s better to start off easier, then graduate to a thicker band over time as you get stronger. 1. Secure the band under one foot and position the band behind your head. Hold so that your elbows are bent at 90 degrees. 2. 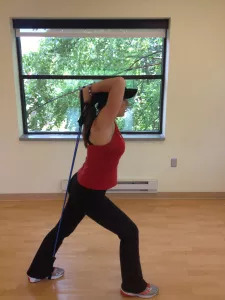 Straighten your elbows and extend your arms upward, contracting your triceps. Repeat 10-12 times.